Originally published by New Statesman, The Staggers blog on 31 March 2016. There are, of course, big differences in the circumstances surrounding Port Talbot in 2016 and those which faced Longbridge when the car plant here was threatened with closure in 2000 and when MG Rover finally went under in 2005. There was no automotive equivalent then of the collapse in steel prices we see today or of the “dumping” of Chinese steel on the global market. 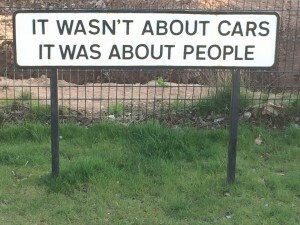 The long term background to what happened at Longbridge said a lot about the way much of the United Kingdom’s own motor industry had been allowed to decline in the late twentieth century. The precise events in 2000 and 2005 were however, specific to Longbridge itself and to the decisions its different owners either made or failed to make at the time. Now is not the time to go over all that again. But this is the time to talk about some of the parallels between Longbridge and Port Talbot and steel. First, as Lewis Goodall’s tweet exemplifies, let us not forget this is about people. Car-making at Longbridge and steel at Port Talbot and elsewhere are not simply about the economies of those areas. They are about their heritage; about community identity and the prospects for the next generation. A focus on building community resilience was a vital part of the response to the collapse of MG Rover in Birmingham. It was only partially successful here – particularly once the immediate crisis had passed – and we are still living with the consequences of that. It will be no less important in Port Talbot. So there are lessons here for ministers over Port Talbot and Steel. Involve local partners, don’t just hand decisions down to them from ministerial working groups. Think strategically and if time is avoidably preventing a viable future being secured, do what is necessary to buy that time. And while taking a public stake in commercial enterprises is not likely to be a solution of itself, it can help – at least on a temporary basis – to put a sustainable strategy in place and to keep it on track.